Respect the process the same way you respect those you love. Don’t be afraid to ask for help or advice along the way, either. Know that you are wise and that you have a plan in place, and at any time, you can tweak this plan to ensure success. Now, go get it done! Now don’t get scared because the Death card appeared. Despite what many think, this card does not represent an actual physical death. Instead, it represents much-needed change. During the month of November, what do you need to release? Do you need to stop smoking? Are you in a toxic relationship? Do you have friends that bring you down instead of supporting you? Then it’s time to throw out all that brings negativity into your world and concentrate on what lightens your world, your heart, your mind, and your life. Many view the Death card as bringing an end to what is called the dark night of the soul, a time where you have been tested. Think of those who have fought and won against a deadly disease or those who have survived a natural disaster (as I write this, those in South Texas are trying to recover from Hurricane Harvey - update: now Puerto Rico and the US Virgin Islands are dealing with the aftermath of Hurricane Maria). These are people who can tell you a lot about the dark night of the soul. Now is the time to get rid of any nasty habits or nasty people. And, if you’re not thrilled with your job, this would be a good time to update your resume and start networking. Not pleased with how your home looks. Feel free to do a little decorating. 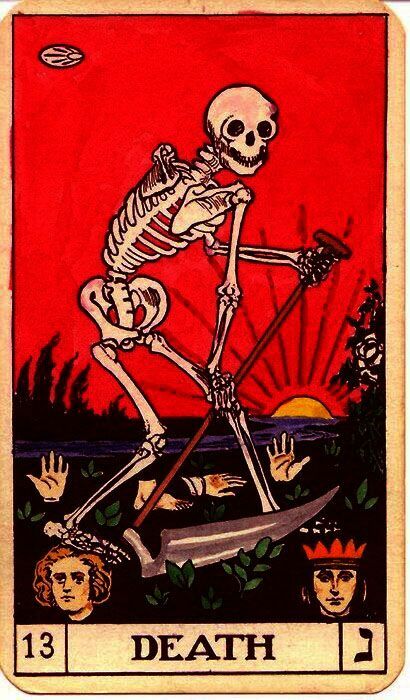 The Death card also ask you to take the time to do some deep inner reflection. Now is the time to look at who you are and decide if you’re living authentically. And, even if you are, if there’s anything in your life that doesn’t feel quite right, take a second look at what’s going on and see what you can do to fix the situation. And, if it can’t be fixed, then walk away. The High Priestess - What Were You Doing in September? This past September, the High Priestess appeared and I told you she represented deep knowledge and understanding. The High Priestess always brings a little magic with her and she appears to remind us that we have magic inside of us, too. So, during December, let’s all find ways to use this magic. What you were doing in September? Think back to this month. Had you started a new project? Made a decision about something? Were you dreaming about doing something new or something you’ve been afraid to do up until that point? Whatever occupied your thoughts or whatever you were doing now plays a part in your December, as you need to follow through on what you were thinking about or doing since The High Priestess energy first visited in September. She has returned to remind you that you must keep doing what you love. If you already started something that brings you joy and fills your life with a bit of magic, keep doing it. If you’ve been thinking about starting something new, then do it now. The year is almost over, so start something new and fresh to bring in 2018 on a positive note. The end of the year can be a joyous time for many. Holiday feelings abound and it can be a lovely time to share joy with those you love. However, remember that not everyone has extended family and friends and many spend this holiday time alone. So, while you’re busy filling your world with magic and spreading harmony amongst those you love, don’t forget those who might need a bit of cheer. And, if you don’t know of anyone who is alone, now is a great time to give to charities who help people who are alone. So, be your own High Priestess and use your understanding of the world condition to spread a bit of magic to others. Here’s to all of our magic and light extending into 2018!